What is your number one value? Would you rather own a home or spend a year traveling the world? Have a steady paycheck or a flexible schedule? Put money away for retirement or splurge on an expensive gift? For many of you, the answer was obvious, but your answer depends on your values. If you value security and stability, you’re less likely to find splurges or a year of travel as appealing as someone who values variety. That’s the thing – your values and beliefs determine your decisions. Your decisions shape your life. Even if we know this fact, oftentimes we don’t always focus on values and beliefs that empower us or move us toward success. It’s easy to get caught up in beliefs that harm us and hold us back. The belief that we’ll never accomplish anything. The belief that we’ll never reach our ideal weight. The belief that we’ll never find a loving partner. Every day you have the choice in what you value and believe. What you do or don’t do. What you notice or don’t notice. What we focus on shapes the life we live. Searching for these answers by yourself can be extremely challenging, but luckily you don’t have to do it alone. 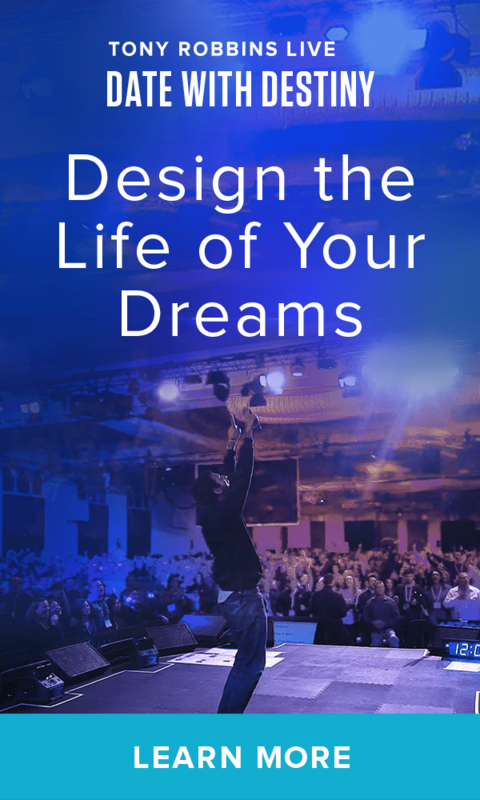 Date with Destiny is a six-day event – live with Tony Robbins – that enables attendees like you to reevaluate their values and beliefs, so they can better connect with their true purpose in life. Plus, get the tools to start shaping the life they desire. Here’s what Date with Destiny can do for you. As Tony Robbins says, “Every decision in your life is controlled by your beliefs and values.” The first step in creating the life you desire is recognizing the power of your beliefs, and that it’s your beliefs that shape your decisions, actions and destiny. At Date with Destiny, you’ll learn how to identify your existing belief systems. Are your thoughts positive or negative? Constructive or destructive? Once you’re aware, you will get the tools to reshape negative beliefs into empowering ones that serve you, or strengthen positive beliefs you already possess. Your personal values and goals deeply affect how you create and maintain relationships. Relationships can be a major source of joy and love, but they can also cause intense disappointment and sadness. At Date with Destiny, you’ll examine how your limiting beliefs about yourself and others are magnified when you enter a relationship. If you feel that love is real only if you’re fighting with someone and experiencing conflict, then you’re going to have nothing but frustration in your relationships. But if you are able to shift the focus in your head, and begin to believe that relationships should be nothing but positive and loving, then you’ll see that reflected in your bonds with others. According to Tony Robbins, “Whatever you hold in your mind on a consistent basis is exactly what you will experience in your life.” Now that you’ve recognized that you’re guided by your beliefs, and that you have the power to change them if they’re not serving you, it’s time to create new rules to live your life by. At Date with Destiny, you’ll work to envision a life you’re insanely passionate about. A life that would fulfill your wildest dreams. A life that can only be achieved by reassessing your current value system. You’ll then create a custom life plan to help you achieve it, which includes your new mission/purpose in life, a list of your most empowering values that align you to achieve that mission and setting new goals for yourself, like changing your focus away from limiting beliefs. By the end of the final day, you’ll have a clear vision of what you want your life to look like. You’ll understand that each thought and action in your day are leading you to fulfill your destiny. You’ll leave with the knowledge of how to control your beliefs, instead of letting your beliefs control you. By reevaluating your method for choosing values and decision-making, you’ll be armed and ready to create the life you crave. If you want to create an extraordinary life, but feel that your limiting beliefs and values are standing in your own way, it’s time to reserve a spot at Date with Destiny. You’ll begin to understand your driving forces, create new guiding values and ultimately adapt strategies that will help you to make positive changes for good. Register today and get ready to ignite the missing passion in your life.